we shall always choose the open sea. Reading the transcript of Hitler’s address, one might be forgiven for assuming that these must be the sentiments of the greatest peacemaker of any era or nation, not a speech by the biggest criminal in the history of mankind. 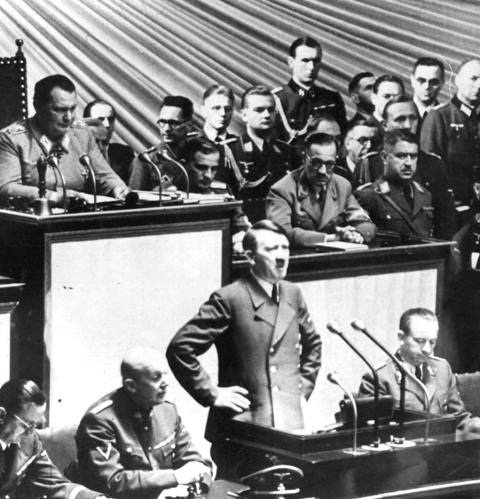 During his political career the Führer spoke often and at length about peace, all the while preparing for war. But there was something special about this speech. It was as if he were speaking to unseen associates in London and Paris, trying to sway them by explaining his position once again, and attempting to influence their decision, although there is little doubt that he already knew what that was. What was Hitler’s goal? To vindicate himself before future generations? To parade his fictitious desire for peace before the German nation, so that later it would be easier to hurl his people into the crucible of the most terrible war? Possibly. But it seems to me that the target audience for this speech consisted of a few dozen people who were shaping Britain’s political policy, and with it – the future events of history. Why should this war in the West be fought? For restoration of Poland? Poland of the Versailles Treaty will never rise again … The question of re-establishment of the Polish State is a problem which will not be solved by war in the West but exclusively by Russia and Germany … It would be senseless to annihilate millions of men and to destroy property worth millions in order to reconstruct a State which at its very birth was termed an abortion by all those not of Polish extraction. “At no time and in no place have I ever acted contrary to British interests,” claims Hitler. What strange words … What was he trying to rationalize before those who had declared war on his country? “German interests are not contrary to British interests” is what he should have said. With one “but” – only if Adolf Hitler had assumed power on his own in his own country, and no one other than German industrialists had had a hand in his career. But we have already shown how England, France, and the US played a role in the establishment of the Nazi regime. Thus Adolf Hitler was justifying before his British sponsors the fact that he was cutting himself loose from their control and going off the “leash.” And he was trying to impress upon them one important point: despite what had occurred, he was not encroaching on their empire and wanted only to engage with them as an equal. Hence his comments about how the West does not need a war. But Hitler’s speech was not a call for peace. It was an attempt to jolt the British and French out of their obstinate unwillingness to make Germany their equal partner on the international political stage. Their differences came down to something very simple: Hitler wanted to first ensure that he received equal treatment, and only then would he be ready to strike at Russia, whom he had always hated. But the Western leaders refused to seat the Germans alongside them at the table until Berlin had fulfilled its duty to crush Russia/the USSR. They were demanding that Hitler withdraw German troops from Polish territory and restore the Polish state. For what purpose? In order to achieve the long-standing goal of Western policy, which was to provoke a conflict between Germany and Russia. 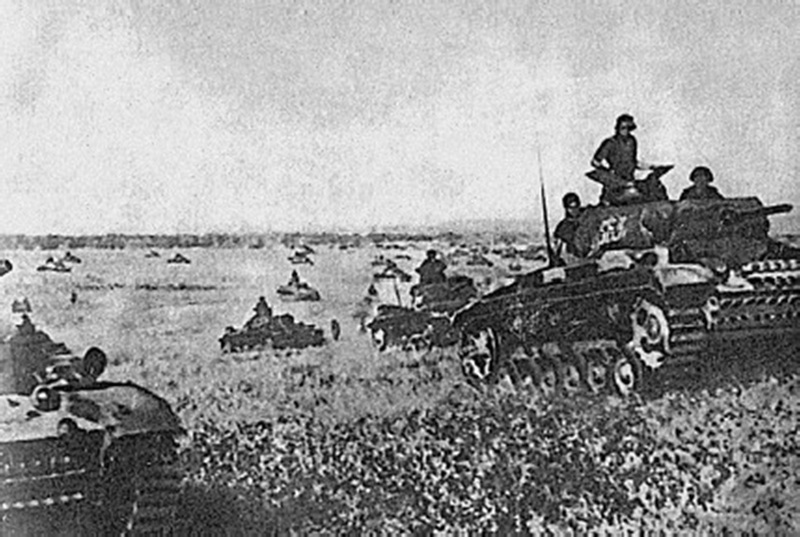 After all, Stalin was unlikely to agree to simply return the land that had been ceded to the Soviet Union under the Soviet-German non-aggression pact. The conditions for the “restoration of Poland” sounded good, but in fact had nothing to do with peace on the European continent, but rather the replacement of one “strange” war with another, more “correct” one. Now, the governments of Britain and France could, from the Führer’s point of view, lend a hand to the Third Reich without losing face. After all, it was not they who had asked for peace, but Germany herself. 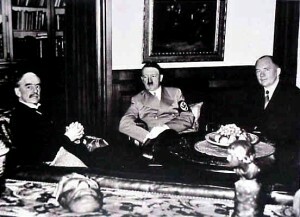 So Hitler’s peace overtures to the West were quite likely meant very seriously. But with the intention of later transforming them into a war with the East. But the Führer’s initiatives went unanswered. Or rather – the answer was no. The next day, Oct. 7, 1939, the French prime minister, Édouard Daladier, told Hitler that France would not lay down her arms until guarantees for a “real peace and general security” were obtained (ibid., 643). On Oct. 12, 1939, British Prime Minister Neville Chamberlain, called Hitler’s proposals “vague and uncertain.” But what the Englishman went on to say should not be misunderstood. The British leader stated that if Germany wanted peace, “acts – not words alone – must be forthcoming.” Hitler needed to show London “convincing proof” that he really wanted peace, i.e., he needed to attack the USSR. What was Adolf Hitler to do? He had offered peace and it had been rejected. All that was left was to prepare to fight. So, he waited three days, then gave his order – to develop a plan to wipe out the enemy that lay closest at hand – France. We’ll never know what it was Adolf Hitler really wanted or how serious were his intentions to decimate the French. But looking at certain facts, we can discern that his main idea was still to negotiate with the West. What are those facts? For example, if Hitler had really wanted to fight London and Paris, he should not have prevented German sailors from carrying out what should have been an unambiguous assignment – to sink enemy ships. But the German navy began fighting so heroically that the Führer had to quickly intervene in order to rein in his excessively zealous captains. During the first week of the war the Germans sank 11 ships, totaling 64,595 tons. If that had continued, soon only German submarines would have been left gliding around the British Isles. But then a real miracle happened: the tonnage of English ships that were sunk in the second week of the war amounted to only 51,561, then another 12,750 tons in the third week and only 4,646 tons in the fourth (ibid., 635). What led to such a sharp decline in the effectiveness of the German submarines? Perhaps the British learned how to sink them? Or were the captains of the British ships becoming more cautious and experienced? No, the British sailors themselves were surprised by these numbers. But it’s not hard to figure out how this “miracle” occurred. Hitler asked his naval commanders not to sink English and French ships! German Admiral Erich Raeder noted in his diary that the general policy was in essence “to exercise restraint until the political situation in the West has become clearer” (ibid., 636). There was a well-known incident in which a German submarine captain requested permission to attack a French warship, the Dunkerque, which was in a vulnerable position, but he was refused. The Führer personally forbade the attack! How did the British and French prepare to fend off his aggression? Sometimes it seemed as though right up until the very end they simply could not believe that the Führer would decide to make a move. Even as heated battles were underway in Norway between German and British forces, the British still kept their planes on the ground. Only a few aircraft flew out on raids – at first during the day, and then primarily at night. During those sorties British planes continued to drop countless propaganda leaflets intended for the German public. And this idyll lasted until May 1940, i.e., until the onset of the German offensive. German tanks in France. Neither Paris nor London expected Hitler to risk a real strike at the West. Which explains why they went down so quickly. ORIENTAL REVIEW published exclusive translations of the chapters from Nikolay Starikov’s documentary research ““Who Made Hitler Attack Stalin” (St.Petersburg, 2008). The original text was adapted for translation by ORIENTAL REVIEW. Charles de Gaulle, The Complete War Memoirs of Charles de Gaulle (New York: Carroll & Graf Publishers, 1998) 557. Albert Speer. Inside the Third Reich. Memoirs (New York: Simon & Schuster, 1997) 165. Franz Halder. The Halder War Diary, 1939-1942 (Novato, CA: Presidio Press, 1988) 672. Hans-Adolf Jacobsen, 1939–1945. Vtoraya Mirovaya Voina // Vtoraya Mirovaya Voina: Dva Vzglyada. 13.